Researchers have solved a nearly 30-year mystery: how the molecular machinery works in an enzyme that makes a potent antibiotic. The findings provide the tools to design new antibiotics, anticancer drugs, and other therapeutics. The potent natural antibiotic, microcin B17, kills harmful E. coli bacteria. Microbial resistance to antibiotics—due to their overuse and misuse—is one of the biggest threats facing humanity, and there’s an urgent need to find new drugs. Natural antibiotics that evolved over eons represent an attractive option to overcome resistance. 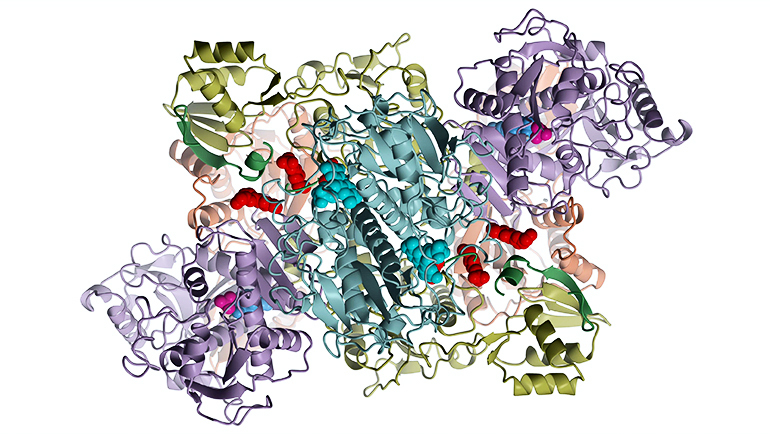 The scientists studied a molecular machine: an enzyme (protein) called McbBCD. The enzyme makes microcin B17 from a smaller protein known as a peptide. Scientists have known about microcin B17 and its unusual chemical structure for decades, but they did not understand the molecular machinery that makes it until now. The scientists found that the enzyme triggers two chemical reactions that produce several chemical “cycles” required for antibacterial activity, according to senior author Konstantin Severinov, a principal investigator at the Waksman Institute of Microbiology and professor of molecular biology and biochemistry at Rutgers University-New Brunswick. The research appears in the journal Molecular Cell. Additional researchers who contributed to the work are from the Skolkovo Institute of Science and Technology in Russia; the Russian Academy of Sciences; Jagiellonian University in Poland; the John Innes Centre in England; and Lomonosov Moscow State University.